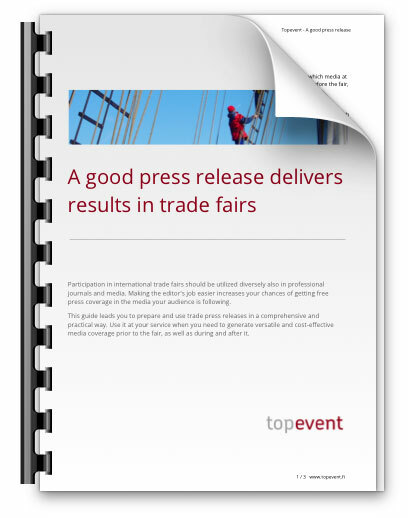 Fairs can be participated in a number of ways, depending on the objectives and available resources. Efficiency arises from planning, focus and a clear division of workload. Few companies have their own resources for the fair design and implementation, so the choice of partners and overall co-ordination should be thought about carefully and realistically. Alternative ways to organize co-ordination, planning and implementation are numerous – essential is the effective use of time and division of labor. Trade fair participation, coordination, planning and implementation can also be bought as a comprehensive service, when necessary. 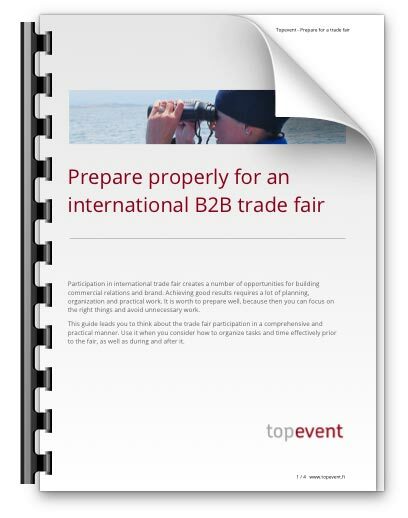 Topevent helps Finnish B2B companies to plan and implement international, business target oriented trade fair and event participations. Enjoy solid and practical international experience, with reliable, flexible and personal touch.